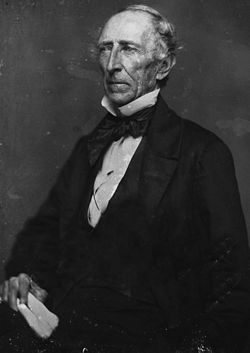 John Tyler (March 29, 1790 – January 18, 1862) was the tenth President of the United States. As the first vice president to succeed to the presidency on the death of an incumbent, he established precedents important to later vice presidents in similar circumstances. Like his predecessor, he was a member of the Whig Party. Tyler served only a single term, the nearly full term remaining after the death of William Henry Harrison in 1841. He was engaged in bitter struggles with rivals in Congress. Once he became president he stood against his party's platform and vetoed several of their proposals. As a result, most of his cabinet resigned, and the Whigs, dubbing him His Accidency, expelled him from the party. While he faced a stalemate on domestic policy, he still made several foreign policy achievements, signing the Webster–Ashburton Treaty with Great Britain and the Treaty of Wanghia with China. Tyler dedicated his last two years in office to his landmark accomplishment, the 1845 annexation of the Republic of Texas. By the end of his term, neither the Whigs nor the Democrats supported him, and he chose not to run for re-election. With little hope for re-election, he created a third party to move public opinion in favor of the annexation of Texas, which led to the 1844 presidential election of expansionist Democrat James K. Polk over Tyler's opponents Henry Clay and Martin Van Buren. Tyler retired from electoral politics until the outbreak of the American Civil War in 1861. He sided with the Confederate government, and won election to the Confederate House of Representatives shortly before his death. As a result of his opposition to the Union, his death was the only one in presidential history not to be officially mourned in Washington. Although some have praised Tyler's political resolve, his presidency is generally held in low esteem by historians. Today he is considered an obscure president, with little presence in the American cultural memory. The ancestors of John Tyler were among the earliest English settlers of Virginia. The family traces their lineage back to Wat Tyler, who in the fourteenth century, in the reign of Richard II, headed the insurrection in England known by his name. 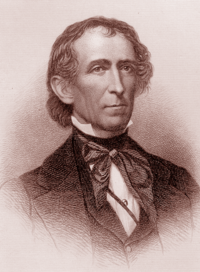 John Tyler was born on March 29, 1790, in Virginia. He was the seventh of eight children born to John Tyler, Sr. and Mary Armistead. His mother died when he was only seven years old. At age twelve, he entered the College of William and Mary Preparatory School. He graduated from the college proper in 1807, when he was seventeen years of age. He then studied law and was admitted to the Virginia bar in 1809. He practiced law for a short time before entering the political arena. Two years later, at the age of 21, he was elected to the Virginia legislature. There, he began a career in state and national politics that lasted with little interruption until he left the presidency. Tyler begin his career in politics when, from 1811 to 1816, he served in the Virginia House of Delegates. During his service in the House of Delegates, Tyler led the effort to censure Virginia's two U.S. senators for supporting the Bank of the United States. When Tyler moved on to become a member of the House of Representatives from 1816 to 1821, Tyler opposed the Bank of the United States, high tariffs, and federally funded internal improvements. He argued against the constitutionality of restrictions on slavery, and stood against Andrew Jackson's invasion of Florida. Tyler was again elected as a Jacksonian Republican representative to the Virginia House of Delegates from 1823 until 1825. Then he was elected governor of Virginia from 1825 through 1827, and fought unsuccessfully for statewide improvements in education and transportation, which reflected his position that internal improvements are the duty of the state and not the nation. He resigned in 1827 to accept his election to the United States Senate. Tyler entered the Senate criticizing then-president John Quincy Adams and his administration, again on the grounds of Adams' support for federal funding of internal improvements. In 1836, Tyler chose to resign his seat rather than comply with orders from the Virginia legislature on which bills to support or oppose. In 1838, Tyler was elected to the Virginia House of Delegates, this time as a Whig candidate from the Williamsburg district. He was named the Speaker of the House in January 1839. He served for one year and was then nominated to the position of vice president. The nomination was intended as a tool to gain Southern support for the 1840 Whig candidate, William Henry Harrison. Harrison won the election, and Tyler became vice president on March 4, 1841. No one could have foreseen then that within weeks Tyler would become president. Just 25 days into office, President Harrison died from pneumonia which he caught from exposing himself to very inclement weather on Inauguration Day. 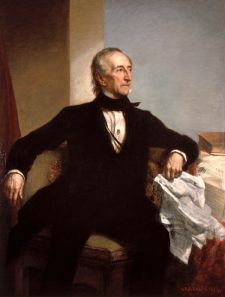 John Tyler, who had just become vice president, was now unexpectedly President of the United States. At first the Whigs were not too disturbed by Tyler as president, although Tyler insisted upon assuming the full powers of a duly elected president. He even delivered an Inaugural Address, filled with Whig doctrine. Whigs, optimistic that Tyler would accept their program, soon became disillusioned. Shortly after Congress passed two bills to create a new Bank of the United States, Tyler vetoed both as unconstitutional; the second amid charges that he had expressed his approval privately before it was passed. During the uproar that followed, Henry Clay argued that Tyler ought to abide by the views of his cabinet and the congressional majority and sign the bank bill or else he should resign from office. A year later when Tyler vetoed a tariff bill, the first impeachment resolution against a president was introduced in the House of Representatives. A committee headed by then-representative John Quincy Adams reported that the president had misused the veto power, but the resolution failed. All the members of the cabinet, except Daniel Webster, resigned in allegiance to Clay. Acting with a speed that suggested he had anticipated this turn of events, Tyler named the new secretaries in two days. On Sept. 13, 1841, the day the Senate confirmed the cabinet appointments, the Whig caucus declared all party ties with Tyler dissolved on the grounds that he was seeking to build a new political party. The congressional Whigs then used every difference with the president as an occasion to charge him with "executive usurpation"—the same charge the party had made eight years prior when censure was brought against Andrew Jackson. Relations became so strained that Tyler was placed in the position of vetoing more bills than Jackson had. In 1842, when the House adopted a resolution charging him with offenses justifying impeachment for vetoing a protective tariff, Tyler sent a "Protest Message" as Jackson had done in 1834. The president succeeded in forcing Congress to pass separate bills for a mildly protective tariff and for distribution of the proceeds from the sale of public lands. He then approved the tariff and pocket-vetoed the distribution bill. In the congressional elections that followed, the Whigs lost control of the House. Tyler perceived this defeat as a sign of public support. In March 1845, however, Congress for the first time in history overrode a presidential veto—for a tariff bill. Having reorganized his cabinet, Tyler devoted his attention to a highly successful foreign policy. He guided negotiations to secure the Webster-Ashburton Treaty, settling the Maine boundary dispute with Canada. In 1842, he extended the Monroe Doctrine, in effect, to the Hawaiian Islands to thwart British interests in the area and sent a trade mission to China. Tyler initiated the annexation of the Republic of Texas. When the treaty he negotiated was rejected by the Senate in June 1844, he suggested that a joint resolution might work just as well. He made annexation a major campaign issue in 1844 and maneuvered both Henry Clay and Martin Van Buren into positions on it that kept both from succeeding him as president. Tyler wavered between creating a new party and imposing himself on the Democrats as their candidate. Succeeding in neither, he considered running as an independent to throw the election into the House, but desisted when the Democrats nominated James K. Polk and supported annexation. In the last days of his administration, Congress passed a joint resolution for annexation. Tyler retired to a plantation named "Walnut Grove" he had bought in Virginia, renaming it "Sherwood Forest" to signify that he had been "outlawed" by the Whig party and withdrew from electoral politics, though his advice continued to be sought by states’ rights Democrats. Tyler had long been an advocate of states' rights, believing that the question of a state's "free" or "slave" status ought to be decided at the state level, with no input from the federal government. He was a slaveholder his entire life. In February 1861, Tyler re-entered public life to sponsor and chair the Washington Peace Convention. The convention sought a compromise to avoid civil war, while the Confederate Constitution was being drawn up at the Montgomery Convention. When the Senate rejected his plan, Tyler urged Virginia's immediate secession. Having served in the provisional Confederate Congress in 1861, he was elected to the Confederate House of Representatives, but died of bronchitis and bilious fever before he could take office. At his request, his coffin was draped with the confederate flag. No public eulogy was offered for the former chief executive since most considered his behavior un-American. He was 71 years of age. His final words were "Perhaps it is best." Tyler is buried in Hollywood Cemetery in Richmond, Virginia. Tyler married Letitia Christian on March 29, 1813. They had eight children, among them Robert Tyler, lawyer, politician, and newspaper editor, whose wife, Priscilla Cooper Tyler, acted as White House hostess during the First Lady's illness. Two years after the death of his first wife, Tyler married Julia Gardiner, on June 26, 1844, becoming the first president to marry while in office. They had seven children. This page was last modified on 23 May 2018, at 15:35.